Nvidia RTX ends with an X, X-Plane starts with one. Perfect match? Nvidia announced their latest bitcoin graphics cards on August 20th at Gamescom this year. Among the usual increase in transistors, they also disappointed all crypto miners by adding a feature that cannot (yet) be used to calculate cryptographic hashes: Ray Tracing! Ray tracing has long been seen as somewhat of a holy grail of graphics rendering, because it’s much closer to replicating the real world than traditional rasterization and shading. However, doing ray tracing in real time has been close to impossible so far. But hey, Nvidia just announced their new RTX GPUs that can do it, so when is X-Plane going to get a fancy ray traced renderer? This and various other questions that have been asked by X-Plane users, as well as some myths, shall be answered! If you have a question that isn’t answered here, feel free to ask it in the comments. What Nvidia has shown is absolutely impressive. Unfortunately, the fine print of all the marketing hype is that sadly it can’t just be thrown in without engineering effort. The first thing needed is actual RTX hardware, which no one at LR currently has. The second thing needed is a Vulkan-based app; we are getting there, but not in any way that would support RTX. (the whole goal of the Vulkan renderer is to not change the way the world looks, so we’ll first need a shipping production Vulkan renderer.) But then… well, it’s not entirely clear what it takes to actually write a ray traced renderer in all of its details. Nvidia has not yet published the specification for the Vulkan extension (VK_NV_raytracing), but they have published slides from presentations. One thing is very clear: you can’t just copy and paste five lines of Nvidia sample code and suddenly wake up in a ray traced world. What Nvidia provides is the scaffolding necessary to describe a scene, as well as to provide new types of shaders that allow casting rays from point A to point B and then report back what they hit along the way. This is a huge amount of work that the hardware is providing here, but it’s not the promised “5 lines and you’ll have ray tracing in your application” that’s being promised. To adopt ray tracing you will have to write the whole ray tracer yourself, from scratch; the hardware just enables you to do so now. This is akin to implementing HDR or PBR: Shaders are the base requirement to implement both of these, but once you have shaders you still need to actually implement HDR or PBR on top of them. Another example is building a house and being provided a plot of land that can support it. Sure, it’s great, now you have a place to build your house, but you still have to come up with a blueprint, pick materials to use and then actually build the thing. Implementing ray tracing will take a great amount of engineering effort, nobody is throwing in awesome reflections with every purchase of one RTX2080Ti for free! The other thing that’s not entirely clear is how well ray tracing will even perform in an environment like X-Plane! Worlds in X-Plane are huge and open, not small scenes from a shooter with tight spacing. Lot’s of rays are needed, and they have to travel quite far, potentially intersecting with large amounts of geometry. How good does the hardware and API scale up to these sizes? Only time will tell. That’s of course not to diminish Nvidias achievement here, it’s an incredible feat of technology in its own right and this is just the first generation! The other thing worth mentioning is that ray tracing is not just something that Nvidia secretly cooked up in their basement for a decade. This is going to be an industry wide thing, with APIs that will work across vendors! Historically one vendor has come out with a fancy new way to do things which then became the standard adopted by other vendors. Nvidia has come forward and offered their extension as base for a core Khronos extension for Vulkan. They have a vested interested in making a cross vendor, cross platform API available. In the foreseeable future, rasterizing renderers are unlikely to go anywhere. Rather, ray tracing for the time being can be used for additional effects that are otherwise hard to achieve. Clearly Nvidia is acknowledging this as well by providing a traditional rasterization engine that by itself is more powerful than previous generation ones. This also means that if X-Plane were to adopt ray tracing tomorrow, you could still run it on your old hardware, you’d just get extra shiny on top if you have ray tracing capable hardware. Last but not least, this is another reason why you should stay away from the shaders! One day we’ll wake up in the glorious Vulkan future which will open the door to the glorious ray tracing future. All of this means that we’ll have to keep changing our shaders. X-Plane 11.26 release candidate 2 is available for users who check “get betas” in our installer or who select public betas on Steam. It’s just like RC1, but without the giant 60 nm jump when the DSFs load. We’re looking to add a junior UI developer to the team in the near future. We need a junior developer to come do user interface work for us. As you may know, the Plane Maker and Airfoil Maker user interfaces did not get the same overhaul that X-Plane itself did for version 11, and we’d like to change that. That’s a major undertaking, and you, dear applicant, could be responsible for it in its entirety. Beyond that, X-Plane itself has a “long tail” of UI improvements that we’d like to see. You could be the one to move these improvements from “The Glorious Future™” schedule into reality. Sidney posted a detailed write-up a few days ago as to why developing an add-on by modifying our shaders is not a good idea. The short version is that, like art controls, the shaders are an internal part of X-Plane that we don’t lock up so you can see them and muck around with them. But there is no stability, documentation, or any attempt to make them useful the way the plugin system is. This confused a number of commenters. Do we want you to use them or not? To resolve the mixed messages, Sidney created this fantastic flow-chart. Hopefully that clarifies where the line in the sand is between “I was poking around” and “I made a serious add-on”. Pretty much everything here goes for the shaders as well as the art controls, only more so. X-Plane has always shipped with the shaders visible to everyone as plain text in the Resources/shader directory. Partly this was due to making it convenient to load the shaders into OpenGL itself, but we also don’t have anything to hide there either so it doesn’t make much sense to try to hide them. You are more than welcome to look and poke at our shaders and if you learn something about X-Plane in the process, that’s awesome! However, the one big caveat to that is that we never considered the shaders to be part of the publicly accessible interface and they are in no way stable across versions. X-Plane is an actively developed product and we are making a lot of changes to the codebase, including the shaders, so you should never ever distribute a plugin or tool that modifies the shaders. Since we give no guarantee that our shaders will remain stable across versions, you’ll always be left worrying that we might break your add-on. This beta brings in many new bug fixes and heavily requested new features! As with any beta, be aware that this could break your project SO MAKE BACKUPS! We don’t think there are any drastic changes to the data model, but, better safe than sorry. #353, #363, and #260 – All relate to warning people and correct what was allowed with NORMAL_METALNESS and BLEND_GLASS. Previously Blend Glass was in the same drop down menu as Alpha Blend, Alpha Cutoff, and Alpha Shadow. Now it is a checkbox allowing you to correctly specify a Blend Mode and apply Blend Glass to it. Existing materials with Blend Glass will see this new checkbox automatically checked. 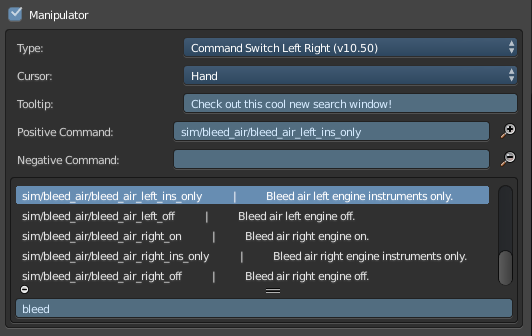 Blend Mode will be set to Alpha Blend or, if your plane is old enough to have been worked on during X-Plane 10, it will be set to whatever it was back then. #366 – An Optimization! Useless transitions in the OBJ were being written, now they’re not. Custom Properties still work, there won’t be any visual changes to your OBJ. We haven’t done any profiling but it might have decreased OBJ loading time by a small amount too. Thanks to #361, just like the Datarefs.txt Search Window, we now have the same capabilities for searching Commands.txt (for manipulators). We are shipping with X-Plane’s latest Commands.txt file, but of course you can replace it with your own (as long as you keep the name the same). One day we hope to make it much more flexible. Thanks to #358, some people who have access to X-Plane’s cutting edge particle code can use XPlane2Blender to specify particle emitters. Don’t worry, we’re all working as hard as we can to get these into the hands of others. Fortunately, XPlane2Blender users can hit the ground running the minute it drops! #302 and #307 – Are you a professional XPlane2Blender maintainer and developer (if so we should probably talk!) Then you need a better build script, and a test script to match! Introducing mkbuild.py, the build script for the modern developer! It creates, it tests, it renames without messy mistake prone human intervention! To top that off, how about a testing script that doesn’t give false positives! 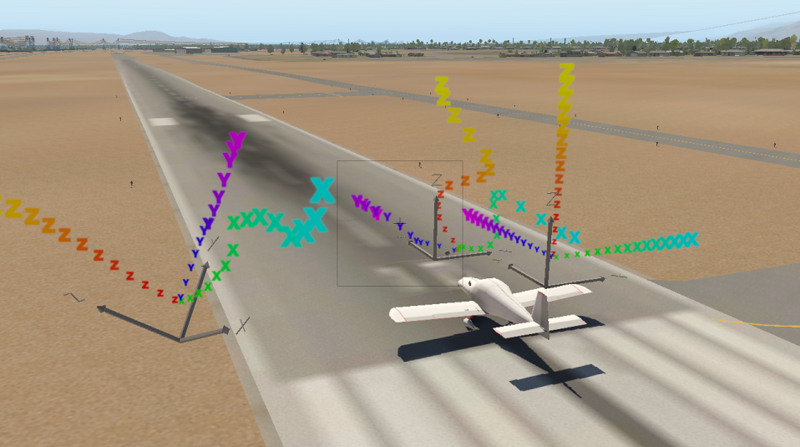 X-Plane 11.26r1 is now in public beta – click “get betas” to get it. It’s just a translation update except one bug fix: we think the weird errors about missing taxiways mid-flight should be fixed. This bug was specific to users who loaded additional nav data into the sim, but if you are one of those users this will hopefully help. WorldEditor 1.7.1r2 is now officially final. WED 1.7.1 supports all of the new airport line types from X-Plane, and also has a slew of new editing options for working with vectors. Widget Windows, You Fancy Now! I have a bunch of XPWidget-based windows. When will I be able to use them with fancy new features like UI scaling, pop-out support, VR support, etc.? Happily, the answer is: now! From this point forward, all widget windows you create will be backed by a modern XPLM window, and can therefore be used with all the new XPLMDisplay APIs. All you have to do from there is call XPGetWidgetUnderlyingWindow() get the XPLMWindowID of your window to pass to those APIs. Posted in Plugins by Tyler Young | Comments Off on Widget Windows, You Fancy Now! A quick correction – the X-Plane Live session will actually be today, Tuesday at 4 pm (20:00 UTC) – I apologize for the total confusion and chaos on this one. We have your questions from the developer blog and social media, and we’ll try to take live questions as best we can. EDIT: T-minus 30 minutes to live stream! We’ll be live here on YouTube. EDIT 2: If you missed the live stream, you can watch the recording: Part 1 and Part 2 (split due to technical difficulties). As Tyler previously posted, we’re doing another X-Plane Live video stream this Wednesday – this one a bit earlier for Europe. A number of commenters pointed out that the Q&A has been a bit of a free-for-all in the past live-streams. It’s hard for us to pick up all of the questions, things get missed, etc. So this time, we’re going to do a mix of live questions and questions submitted ahead of time. If you have something you want to bring up, please post in the comments section for this post. You can also ask questions via Facebook or Twitter – Thompson will post start a feedback thread on FB tomorrow. Please only use this blog post for questions for the live session next week. We are almost certainly not going to be able to answer everything that gets asked, and there will probably be questions where the answer is more or less “we’re working on stuff but it’s rully rully secret right now”. But we will read everything that gets asked here and do our best to make sure big things don’t get lost.